48 hours later Trump supporters howled. The family of the young male at the center of the now infamous image hired a public relations firm. Longer videos emerged showing that the situation was greyer than it first appeared. These videos showed a group of African American men who identify with the Hebrew Israelites shouting and taunting the young white males in the MAGA hats. The elderly, native American had in fact voluntarily walked into this conflict beating his peace drum. Outrage instantly ensued. Media outlets ran new stories. Talking heads opined on the calm, dignified behavior of the Christian boys from Kentucky. The boy wasn’t smirking, he was smiling! Influencers tweeted furiously about the boys who were unfairly targeted by the left and under attack by the liberal media – all for being Christian, white males wearing MAGA hats. This confrontation and the ensuing fiery debate it prompted is one of the best and most recent examples of how this country is no longer just mired in partisan politics but has sunk into full on tribalism. It should be noted that the best example prior to this was the Brett Kavanaugh hearings in which the parallels between the white, male, catholic right tribe versus the left, liberal tribe are eerie. Tribes demand loyalty. In return they give belonging and identity. They don’t encourage or even require thought. Politicians who think for themselves and break with their parties are no longer mavericks. They are traitors. People who share what you don’t want to see on social media are unfriended and unfollowed. Erased from your digital life. There is no question President Trump has inflamed tribalism in America. But he is not solely to blame. Social media, cable news and how Americans choose to get their information has also escalated tribalism to levels arguably unseen in modern American history. It is much easier to stay in your tribe, hurling outrage, indignation and insults, from your twitter handle and Facebook page than it is to do the same face-to-face over coffee at the general store. That righteous indignation is only stoked further when you limit your media consumption to MSNBC and friends on Facebook that share liberal memes or to Fox and right-wing influencers on twitter. This is all encapsulated perfectly in the confrontation at the Lincoln Memorial. People see what they want to see. 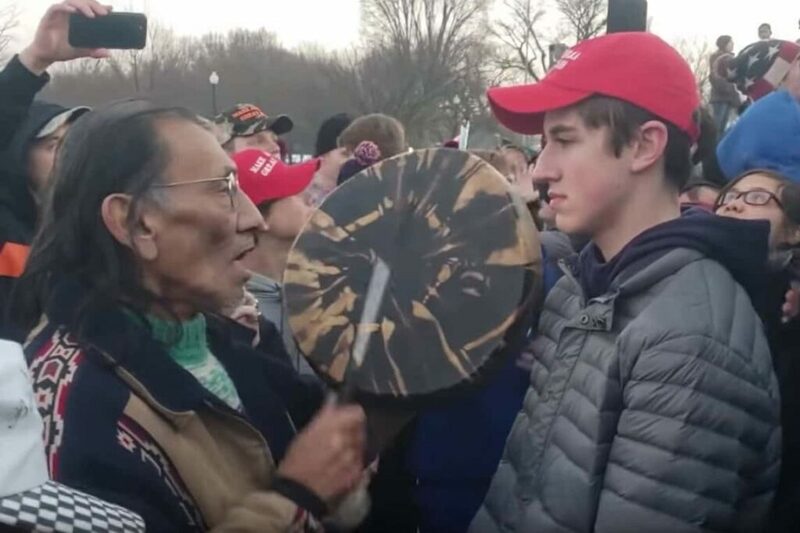 They either see a group of young, white, MAGA hat wearing racist, overprivileged and disrespectful males dominating a poor, helpless Native American or they see a group of young, white boys from Kentucky who have been unfairly targeted by the left-wing media because they are wearing MAGA hats and attending a Right to Life March. When you are protecting your tribe, the actual facts don’t matter as much. What matters is protecting your tribe. One thing is for sure, whichever way people see it, they likely respond by flaming the debate through sharing their outrage on social media. The media, in their desperate stampede not to miss a story (and its corresponding clicks) that is already being shared thousands of times on social platforms immediately pushes out a story with “facts.” And the cycle continues. Is this tribalism bad for our democracy, our society and the very future of our country? Absolutely. When you see a new story, a meme, a video on cable news or your social feed, rather than making snap judgements and disseminating further outrage on social media, people should step back. Think. Are they being purposefully manipulated? People should listen to the other side, regardless of how much they may disagree. Listening to another person’s point of view – ideally a person from another tribe – and responding thoughtfully and respectfully is likely one of the only ways out of this mess.